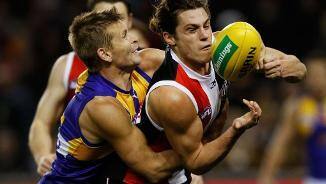 St Kilda's tackling pressure may be enough to get them over the line, they currently lead the count by 75 to 47. Jack Steele is having arguably, his best game for St Kilda with a careerhigh 20 contested possessions as well as 10 tackles and 10 clearances. The Saints have completely dominated this quarter, winning the time in forward half by 66 per cent and creating 13 chains to 1 in the forward half. 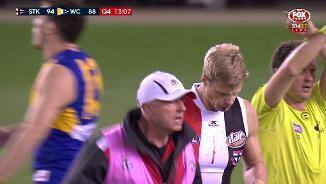 Saints InterchangeNick Riewoldt off due to the blood rule. It has been a battle of offense in this final quarter with 7 goals being created from 10 inside 50's. St Kilda has had the upper hand with 4.2.26 from their six inside 50's. 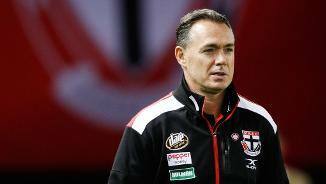 St Kilda will be ruing their missed opportunities in front of goal. The Eagles have created an inside 50 from half of the Saints behinds, resulting in 3.1.19 from these chains. It has been a fastpaced start to the quarter with the Eagles converting both inside 50's into a goal and St Kilda converting their first 2 inside 50's into scores. Josh Kennedy has been a focal point to the Eagle's efficiency today with 4 marks inside 50 and 4 goals from 12 inside 50 targets. 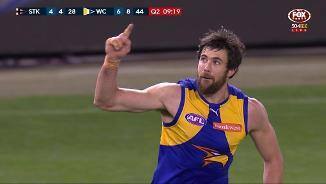 Jack Darling has been directly involved in 7 of the Eagle's 20 scores. He has 4 scores assists and 1.2.8. For, St Kilda, Jack Billings has had 5 score assists and 2 behinds. Both teams are now transitioning well with 5 of the 6 goals generated from the defensive half this quarter. St Kilda has created 3 of their 5 scores from their defensive midfield this quarter. All four of West Coast's inside 50's this quarter have been sourced from their defensive half. This includes 2 goals generated from both their kickins. Saints InterchangeJack Newnes off due to the blood rule. St Kilda leads the inside 50's (3726) and time in forward half by 14 per cent. Yet, the Eagles continue to punish their errors in transition launching 3 goals from defensive 50 chains. St Kilda's kicking efficiency is 8 per cent greater than West Coast in the forward half. As a result, they have launched 6.1.37 to 4.4.28 from attacking midfield chains. St Kilda have had the early advantage this quarter, leading the clearances (31), inside 50's (5-1) and launching two goals to one. The Saints have been efficient this quarter, creating 5 marks inside 50 and launching a score from 58 per cent of their 12 entries. St Kilda has applied more pressure today with 27 tackles to 18.They have been led by Jack Steele with a gamehigh 5 tackles as well as 5 clearances. 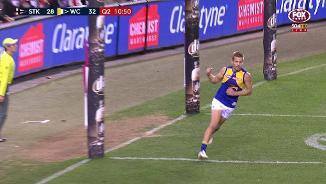 Eagles InterchangeShannon Hurn off due to the blood rule. Saints InterchangeJack Steven off due to an injury. West Coast has won the inside 50's (114) in this quarter with 6 of those coming from attacking midfield intercepts. In this quarter, they have generated 3.2.20 to 0.0.0 from this source. West Coast has been far more effective from defensive 50 chains. They have launched just two more chains from this zone, but have created 2.1.13 more than St Kilda. The Eagles have kicked 1.7.13 from set and snap shots on goal, conversely St Kilda has kicked 4.2.26 from these shot types. 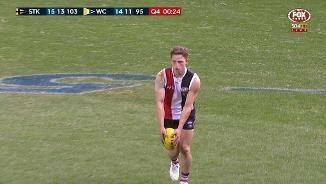 That was St Kilda's first goal launched from 5 defensive midfield intercepts. They are ranked number one in the competition, at creating scores per chain from this zone. Dom Sheed has had an influential start to the game with a gamehigh 12 disposals, 6 contested possessions and 5 score involvements. 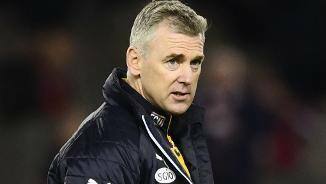 Despite playing without a noted ruck man, West Coast lead the clearances (85) and have outscored St Kilda (2 goals to 1) from this source. They have also generated 4 more scores from intercepts, however these have all been behinds. Both teams are transitioning well with St Kilda creating 3 inside 50's from 5 defensive 50 chains. However, West Coast has been more efficient on the scoreboard, creating 1.1.7 from 6 chains. The Eagles have had just 4 of the last 11 inside 50's, but have been extremely efficient inside 50, creating a score from 57 per cent of entries. The Eagles have won all 4 clearances around the ground, creating 3 inside 50's form this source. However on all four occasions, St Kilda has intercepted the ball in their defensive half. That goal to Tim Membrey came as a result of St Kilda's first chain launched in the forward half. The Eagles have had a dominate start, winning the clearances (31), inside 50's (3-1) and time in forward half (63-37 per cent). Of the Saints score this season, 65 per cent has been from anintercept. This is the secondhighest percentage recorded by aside. Over the past five weeks, West Coast has taken a mark from 24 per cent of its kicks into the forward 50. This is the secondhighest percentage recorded by a side. Welcome to Etihad Stadium for the St Kilda v West Coast Eagles Round 20 clash. A LAST-MINUTE goal to Jack Billings helped St Kilda exorcise its demons and seal an eight-point win against West Coast at Etihad Stadium on Sunday, keeping alive the Saints' finals chances as they bid to make the top eight for the first time since 2011. A week after St Kilda conceded a goal at the death against Port Adelaide, it was the young Saints who showed poise this time, coming over the top to win 15.13 (103) to 14.11 (95), and put the Eagles' finals prospects in jeopardy. The Eagles sit ninth with three matches left, having missed the chance to sneak into the eight ahead of Essendon, while St Kilda is 11th, also on 40 points. 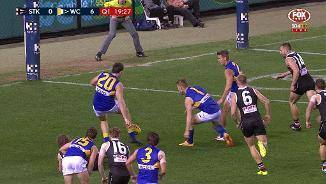 Pouncing on an errant kick from Eagles defender Eric Mackenzie that Jeremy McGovern coughed up with time running out, Jade Gresham sent the ball forward to allow Billings to take a strong mark and slot his set shot. Billings slotted two goals in the final term, one after a brilliant pack mark, capping one of his better games of the season to put his side 10-9, and giving Nick Riewoldt a chance for one last finals appearance. 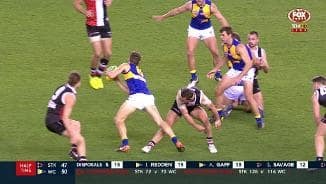 Riewoldt was off the field for much of the last term after a head clash with Dom Sheed left him concussed, but his teammates did him proud. It was a gripping contest full of crucial moments but the Saints dominated play in the final term, winning the contested possession count by 31. Just eight days after the Saints coughed up two last-minute goals to the Power, coach Alan Richardson was delighted his side's brave effort in a frantic game was rewarded. "You're just so pleased for the boys," he said. "We couldn't have been any more dominant in the last quarter but weren't able to really get reward. (West Coast) defended really strongly. "It was one of those games where just for the players to be able to get the satisfaction of being able to come in and sing the song after working so hard is really pleasing, and they thoroughly deserved it." Earlier in the final term, the Eagles looked like running away with the game after opening up 14-point advantage thanks to goals from Josh Kennedy, Jack Darling and Mark LeCras, with a Luke Dunstan snap interrupting those efforts. Kennedy nailed five goals and had the better of Nathan Brown to keep alive his hopes of winning a third-straight Coleman Medal, his season tally of 54 trailing leader Joe Daniher by two. 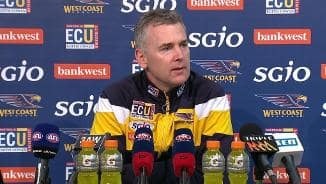 West Coast coach Adam Simpson refused to take a pessimistic approach after the match, despite the Eagles being dominated in general play late in the game. "I think I'm going to look at the glass half-full on this one. The effort and the intent is there but the ability to execute all day is something we're working on," he said. "We got blown away in the last quarter in the contest and around the ground… we couldn't hold up for long enough." The Saints responded to the Eagles' surge, with a running goal from Shane Savage and Billings' outstanding mark and goal putting their team within two points. Jack Steele showed awesome strength at a stoppage in the forward line, collecting the tap with his right hand and snapping the goal through despite heavy pressure from Will Schofield to put St Kilda ahead by five, a lead it wouldn't concede for the rest of the game. It was a superb game from the former Giant, who finished with 26 disposals, 20 contested possessions and two goals. 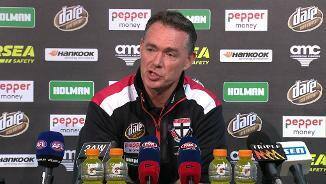 St Kilda: Riewoldt was concussed in the final term after a head clash with Dom Sheed but the feeling from St Kilda was that it won't cost him any games. There was concern for star midfielder Jack Steven when he copped a knee to his right hip in the second term. He went to the bench and came back on to the ground briefly before going down the race and coming back on with a few minutes left in the quarter. Dylan Roberton had a knee worked on in the first quarter but it didn't seem to give him great cause for concern for the rest of the game. Jack Newnes had a cut to the face and had a short stint on the pine. West Coast: Skipper Shannon Hurn came off with some bleeding and returned with a bandage around his head in the second quarter. West Coast should be able to bounce back when it returns home to take on a gritty Carlton side next Saturday night. 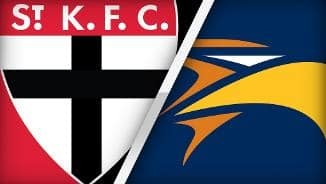 The following day, St Kilda and Melbourne will play their most important match in many years when they meet at the MCG.